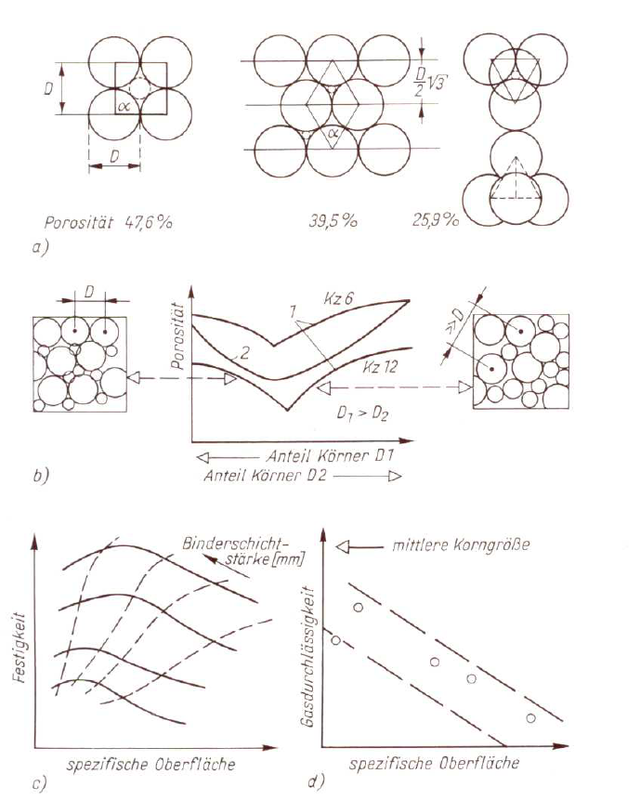 According to W. Tilch, under the assumption of a bulk grain material with grains of the same diameter and same spherical shape, theoretically, the possibilities for the spatial configuration of the grains with one another shown in Figure 1a arise. (s. Table 1). For the “bulk sphere material” with a uniform grain diameter, the lowest porosity value is to be expected with a packing density of 1.963g/cm3. Depending on the metal penetration (s. Penetration)and the effects on the casting surface, it is not the overall pore volume but the size of the individual pores which is important. For a real grain bulk material, existing different grain shapes and grain sizes with different quantities of individual grain fractions influence porosity and packing density. This affects the bonding and permeability properties. Different grain sizes in a certain proportion can lead to a porosity minimum, i.e, to a high packing density (Figure 1b). This occurs as long as fine grain fractions can be stored in the pore cavities of the rough fraction without changing their spacing. An additional increase in the amount of fine grains then leads to an “expansion” of the grain spacing in the rough fraction; the porosity increases. It is possible to calculate the proportions of different gain fractions for grain mixtures, with which a minimal value of porosity can be achieved. This makes it possible to react to changes in the surface quality of the casting or defects which occur. Grain mixtures with a wide grain range which correspond to a logarithmic normal distribution can behave very differently in the formation of the grain structure as they are influenced by the grain size, grain distribution and other factors (proportion of binder and fine grains). The effects of changed grain characteristics on the packing density and therefore also on the technological mold material properties are therefore not always recognizable. By including other characteristics, such as the specific surface of the bulk grain material (s. Theoretical specific core area), relationships can be made clearer. Both the strength properties (Figure 1c) and gas permeability (Figure 1a) have a significant influence. High strength values for a certain specific surface are connected to the formation of an optimum contact surface and binder course thickness.